There are lots of sofas beds these days that look okay, but most have that damned bar that cuts up into your back when you try to sleep on them. 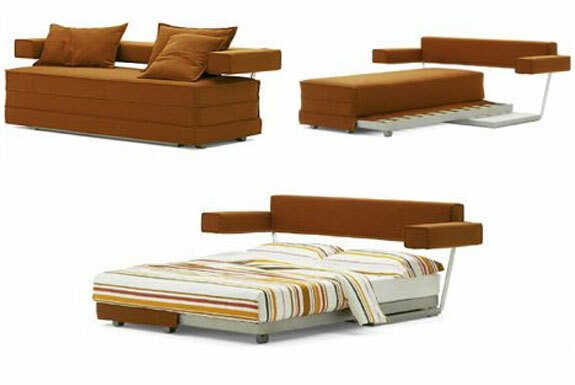 The Book bed from Italian designer Flou does not transform between sofa and bed via the traditional fold out model. Instead, the seat part of the sofa is comprised of three sturdy mini-mattresses. When it is time to sleep on the sofa, wheel out the base, unpile the small mattresses and arrange them in bed form. The Book sofa comes in a variety of styles, including one with retro arm rests (above) and adjustable head-board (below, after the jump).